Why is Balance and Scale Calibration Important? - - What is balance calibration and why should I calibrate? What is balance calibration and why should I calibrate? 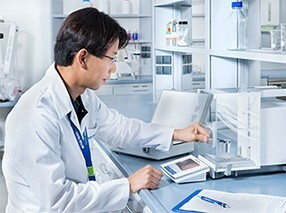 Balance or scale calibration is essential to achieve accurate weighing results. Ignoring this important service activity turns measuring into guesswork. In other words, it is negligent to weigh with a non-calibrated balance or scale. The accuracy of balances and scales becomes less reliable over time. This is the result of normal wear and tear caused by regular use and external factors such as mechanical shocks or hazardous environments. This may lead to a rather quick degradation or deterioration over a longer time. Periodically scheduled balance calibration in combination with frequent routine testing greatly enhances the life time of your balance or scale and its weighing accuracy. But what is calibration? In simple terms, calibration is a quantitative comparison. To check the reading of a balance or scale, a reference weight is placed on the pan. The error is defined as the difference between the measured value (the reading) and the true value (the reference weight). The question whether this error is trustworthy or not, will be outlined below. At the end of balance calibration, a certificate is created, which reports the balance or scales readings and compares them to a reference value. Applied tolerances result in a Pass/Fail statement.